Debbie Gibson, Tiffany ready to bring the best of the 80s to Pinoy fans! 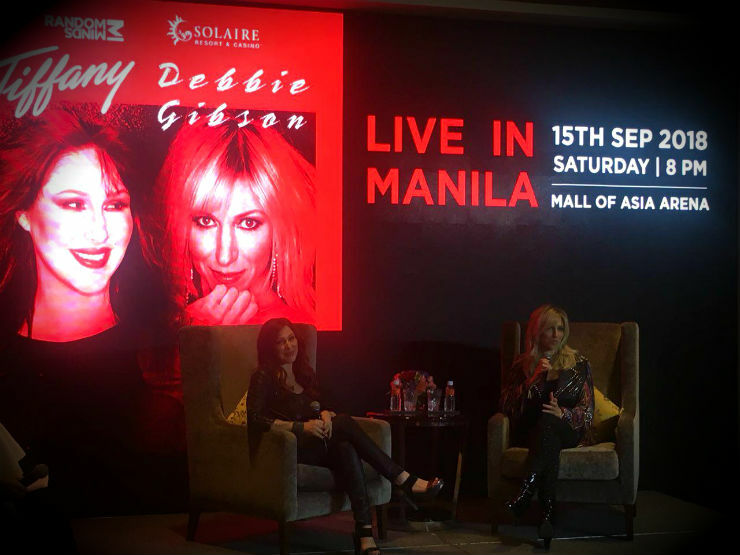 Eighties pop icons Debbie Gibson and Tiffany are finally in Manila for their one-night-only concert Debbie Gibson and Tiffany Live in Manila at the SM MOA Arena tomorrow! READ: 80s pop icons Debbie Gibson and Tiffany, coming to Manila! Despite Typhoon Ompong’s arrival, the two singers are extremely determined to give their Filipino fans the best of the 80’s during their show, with Tiffany’s power ballads and Debbie’s dance anthems. Debbie Gibson, known for her upbeat tracks like "Electric Youth,” Shake Your Love," and “No More Rhyme,” also promised a show full of high energy and costume changes on her end. “There’s a lot of costume changes and fun stuff. I’m the theatrical one of the two of us!” said Gibson. And it looks like their fans can't wait to see them either! Debbie Gibson and Tiffany Live in Manila is produced and presented Random Minds and Solaire Resort and Casino. Tickets are available at SM Ticket outlets. Titos and titas of Manila, are you ready to get your groove on? Sound off in the comments!